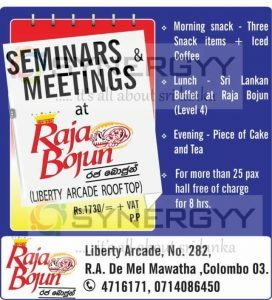 Are you a freelance lecturer or trainer or a person who looking forward a hall for your meeting or seminars, here is best cost and comfortable place for your seminar and meetings to be held in prime location in colombo. for more than 25 Pax hall will be free of charge for 8 hours. 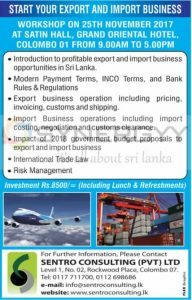 Sentro Consulting (Pvt) Ltd organize a workshop on Export & Import Business on 25th November 2017 at Satin Hall, Grand Oriental Hotel, Colombo 01 from 9.00 Am to 5.00 Pm. 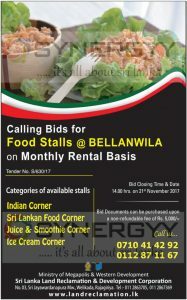 Ministry of Megapolis and Western Development calling bids for Food Stalls @ Bellanwila on monthly rental basis. It has been decided by the Coconut Development Authority that obtaining prior approval for newly opening is mandatory, in terms of the Coconut Development Act No. 46 of 1971 and amendments thereof and as per the Gazette Notification No. 15009/09. 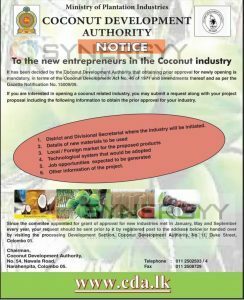 If you are interested in opening a coconut related industry, you may submit a request along with your project proposal including the following information to obtain the prior approval for your industry. Since the committee appointed for grant of approval for new industries met in January, May and September every year, your request should be sent prior to it by registered post to the address below or handed over by visiting the processing Development Section, Coconut Development Authority, No. 11, Duke Street, Colombo 01. 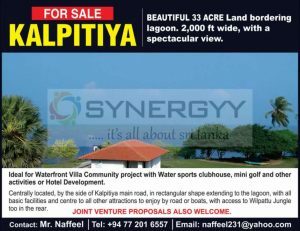 Beautiful 33 acre land bordering lagoon with 2,000 ft wide with a spectacular view of Kalpitiya Beach available for sale. This land is Ideal for Waterfront Villa Community project with Water sports clubhouse, mini golf and other activities or Hotel Development. Centrally located, by the side of Kalpitiya main road, in rectangular shape extending to the lagoon, with all basic facilities and centre to all other attractions to enjoy by road or boats, with access to Wilpattu Jungle too in the rear. Joint venture proposals also welcome. Sri Lanka Land Reclamation & Development Corporation of Ministry of Megapolis & Western Development invites tender for Dairy Food & Drinks and Sea Food Corner at Diyatha Uyana park at Battaramulla. 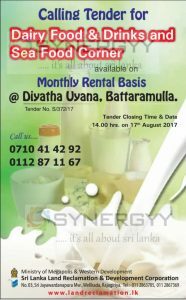 This is a good business opportunity for youths to takeover a small business and run a show at Diyatha Uyana at Battaramulla. The Sri Lanka Export Development Board (EDB) proposes to organize a SME pavilion at Facets Sri Lanka – International Gem & Jewellery Show 2017 to be held at the Sirimavo Bandaranaike Memorial Exhibition Center from 31st August to 3rd September 2017. 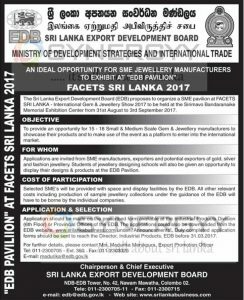 Sri Lanka Export Development Board invites applications from the SME Jewellery Manufacturers to Exhibit on their pavilion. To provide an opportunity for 15 -18 Small & Medium Scale Gem & Jewellery manufacturers to showcase their products and to make use of the event as a platform to enter into the international market. 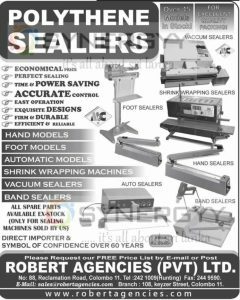 Applications are invited from SME manufacturers, exporters and potential exporters of gold, silver and fashion jewellery. Students of jewellery designing schools will also be given an opportunity to display their designs & products at the EDB Pavilion. Selected SME’s will be provided with space and display facilities by the EDB. All other relevant costs including production of sample jewellery collections under the guidance of the EDB will have to be borne by the individual companies. Application should be made on the prescribed form available at the Industrial Products Division (6th Floor) or Provincial Offices of the EDB. 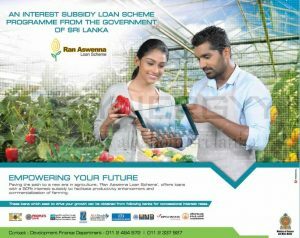 The applications could also be downloaded from the EDB website, www.srilankabusiness.com under “Announcements”. Duly completed application forms should be sent to reach the Director, Industrial Products, EDB before 31.03.2017. National Aquaculture Development Authority, Ministry of Fisheries and Aquatic Resources Development of Sri Lanka invite applications for new projects in aquaculture. On the proposed Budget for 2017, Rs. 1,200 million has been allocated to the Ministry of Fisheries and Aquatic Resources. This allocation is for poverty elimination and livelihood development through self-employment projects, providing infrastructure facilities and initiation of new employment opportunities. Applications are called for from Sri Lankan citizens, for the under mentioned projects by the National Aquaculture Development Authority of Sri lanka. 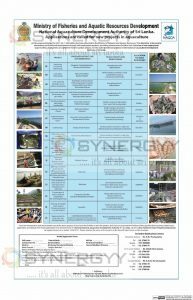 If you are interested to start and maintain one of the above projects, if you have the facilities to start the project, and if you are a permanent resident of the specified district, please submit your application according to the model application form printed below to Chairman,National Aquaculture Development Authority of Sri Lanka, no. 41/1, New Parliament road, Pelawatta, Battaramulla by registered post on or before 15.04.2017. Please mention the name of the project on the top left hand corner on the envelope.